Rentals - Waterville Estates Realty Homes, town-homes, condos and land in Campton, Thornton and Waterville Valley. 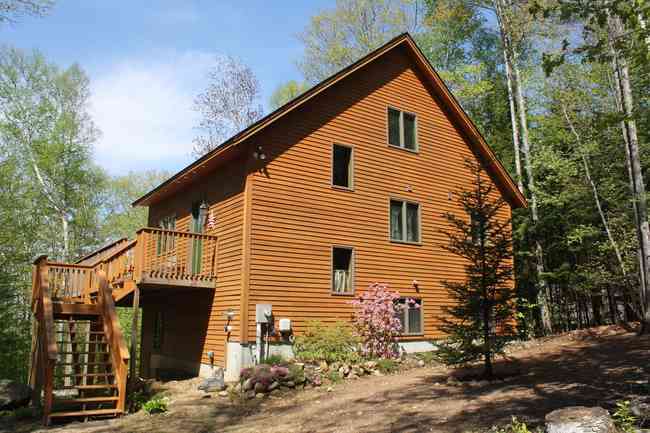 Luxury mountainside accommodations in the resort of Waterville Estates. 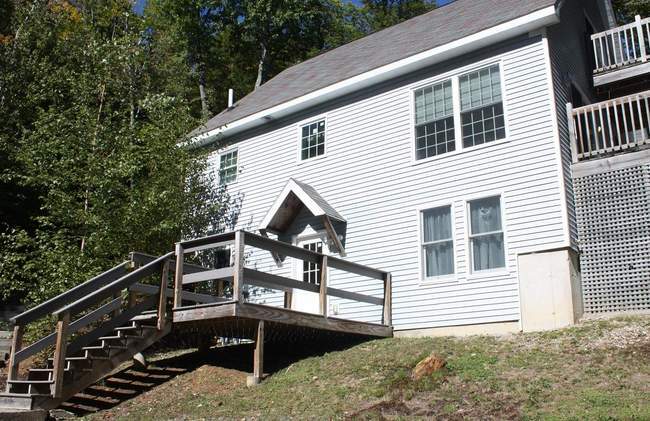 Situated on a beautiful mountainside in the White Mountains of New Hampshire, this immaculate, completely updated, condo features peaceful views while being a short walk to all the amenities of the Recreation Center. Whether it's hiking, skiing or just relaxing, this "home" offers it all: indoor pools, outdoor pools, tennis courts, basketball, live music, playground, fishing, hiking & cross country trails, hot tub, to name a few. Enter this 3 bedroom, 2 bath condo into a spacious living room with wall TV, electric fireplace and game table area. Sunny dining area and fully equipped galley kitchen round out this level. 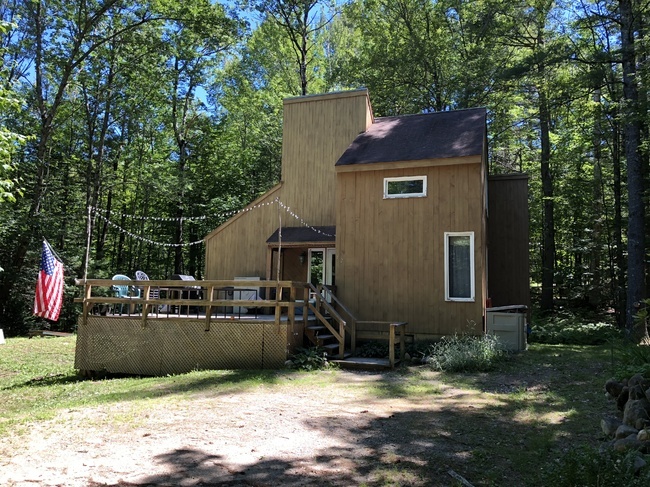 Down one level is a bedroom with full size bed and a bathroom, down more steps to another beautiful family room with gas fireplace and sweeping forest views. This level has the master bedroom with queen size bed, another bedroom with 2 sets of bunk beds (4 twins), a bathroom and full size washer and dryer. Ample parking is available onsite. Rental comes with linens, bath towels, cookware, use of dumpster for trash, (4) passes to the Community Center and cleaning & laundry upon departure. We are an onsite Management Company should problems arise. 2 Night Minimum, Rates change seasonally. June 29 - Columbus Day & Jan 2 - March 31: $230 nightly, $1450 weekly Apr 1 - Jun 28 & after Columbus Day - Dec 21: $180 nightly, $1135 weekly Holiday Rate (12/ 22 - 1/1 & Feb Vacation Week): $250 nightly, $1575 weekly (3 night minimum) 9% Room Tax. NH rooms tax number: 054096 No Resort Fees! No pets! 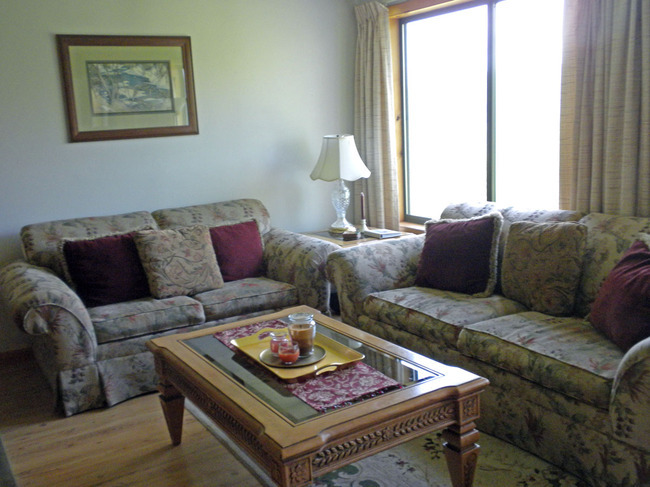 Guests are sure to enjoy a memorable vacation in this fully furnished vacation condo. There is lots of space in this comfortable tri-level town home. The entry level features a foyer, two bedrooms (one with a king bed and one with a full bed) and a full bath. The full bedroom has a washer/dryer, iron and ironing board in the closet. The lower level offers a living room with vaulted ceilings and skylights, dining area and open kitchen. Two bedrooms (one with a full bed and the other with a daybed) and another full bathroom complete the upper level. Surprises abound with two separate ladder-accessible lofts with twin beds. One loft is in the day bed room and is set up with a game center. WiFi, TVs/VCRs and many games and books round out this condo. 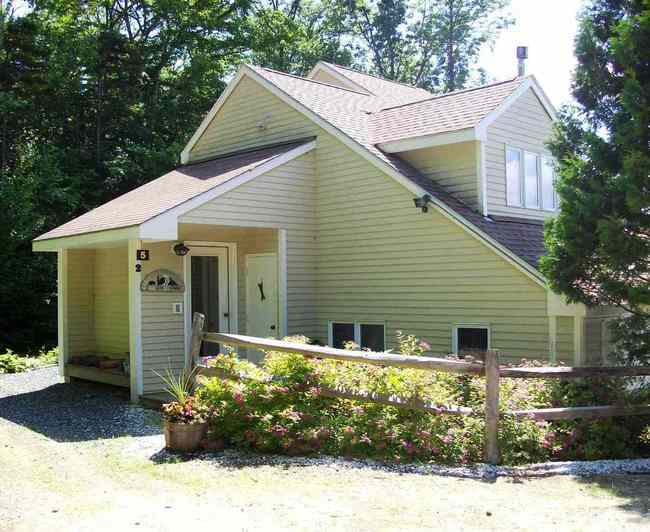 Sunny and pleasant, this townhome is an easy walk to the Community Recreation Center. Rental comes with linens, bath towels, cookware, use of dumpster for trash, toilet paper, paper towels, bath soaps, trash bags, (4) passes to the Community Center and cleaning & laundry upon departure. We are an on-site Management Company should problems arise. Situated 2/10 of a mile from the Community Recreation Center, guests can walk over to enjoy two indoor heated pools, two outdoor heated pools, three spas, fitness room, game room, and locker rooms with saunas. There are basketball, tennis and volleyball courts as well. The pond has a sandy beach, floating dock and paddle boats. You will have access to four community center passes. Children under seven years of age are free. You can purchase additional day passes for $10 per day on weekdays and $20 on weekends & holidays. There are Two pub/lounges on site at the Community Rec Center, the "Summit Lounge" and the "Mountain View Lounge.” There is a third, the "Tail Spin Lounge" at our own Campton Mountain ski hill base lodge (open seasonally). 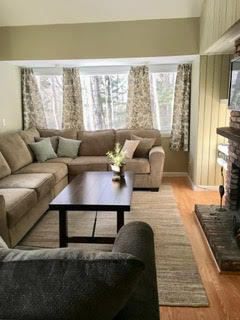 We are located a half mile away from Campton Mountain Ski Area, where guests can enjoy skiing and snowboarding for $20 afternoon or night ski sessions. Waterville Valley Ski Resort (10 Miles) and Loon Mountain Resort (19 Miles) are nearby as well. Spend the day away, enjoying nearby attractions such as Clark's Trading Post, Franconia Notch, Whale's Tale Water Park, Flume Gorge, Polar Caves Park, Lost River Gorge, and Santa's Village. 2 Night Minimum, Rates change seasonally. June 29 - Columbus Day & Jan 2 - March 31: $230 nightly, $1450 weekly Apr 1 - Jun 28 & after Columbus Day - Dec 21: $180 nightly, $1135 weekly Holiday Rate (12/ 22 - 1/1 & Feb Vacation Week): $250 nightly, $1575 weekly (3 night minimum) 9% Room Tax. NH rooms tax number: 054096 No Resort Fees! No pets! Great mountain views all year round. This three level townhouse style unit provides you many options for accommodations. The entry level has a foyer, kitchen, dining area and a good sized living room. 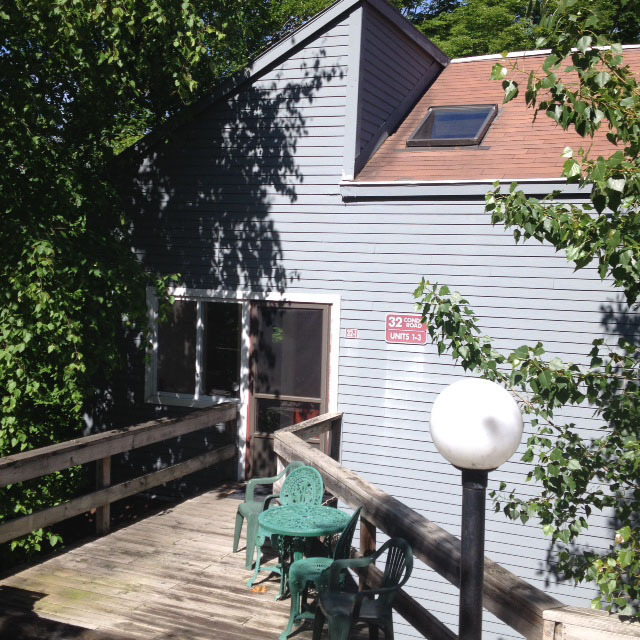 The upper level has a queen bed in the master bedroom, a full bathroom, and a loft with a twin bed and small couch. On the lower level you'll find a bedroom with a queen bed, with a walk-through to another bedroom with a bunk bed. There's a third bedroom on the lower level that has a bunk bed with a double bed on bottom and twin on top. Another full bathroom and laundry room are also on the lower level. Rental comes with linens, bath towels, cookware, use of dumpster for trash, toilet paper, paper towels, bath soaps, trash bags, (4) passes to the Community Center and cleaning & laundry upon departure. We are an on-site Management Company should problems arise. Your rental includes four passes to the on-site Community Recreation Center complete with two heated indoor pools, an outdoor pool, hot-tubs, saunas, fitness room, tennis and basketball courts, picnic and play areas, and a pond with sandy beach. Two pub/lounges are also on site. No pets and no smoking. 2 Night Minimum, Rates change seasonally. June 29 - Columbus Day & Jan 2 - March 31: $240 nightly, $1510 weekly Apr 1 - Jun 28 & after Columbus Day - Dec 20: $190 nightly, $1195 weekly Holiday Rate (12/ 21 - 1/1 & Feb Vacation Week): $260 nightly, $1635 weekly 9% Room Tax. NH rooms tax license number: 054096 No Resort Fees! This home has three levels with a bathroom on each level. Main level features a large open kitchen/dining area, comfortable living area, bedroom with a queen bed, full bath, laundry, and sliders to a large wrap-around deck. On the upper level are two more bedrooms, each with a queen bed and a bunk bed with a full bed on the bottom, and twin on top. There's also another bathroom on this level. The entry level has a game room for family entertainment, a bathroom, and two bonus rooms. Rental comes with linens, bath towels, cookware, use of dumpster for trash, toilet paper, paper towels, bath soaps, trash bags, (4) passes to the Community Center and cleaning & laundry upon departure. We are an onsite Management Company should problems arise. Your rental includes four passes to the on-site Community Recreation Center complete with two heated indoor pools, an outdoor pool, hot-tubs, saunas, fitness room, tennis and basketball courts, picnic and play areas, and a pond with sandy beach. Two pub/lounges are also on site. 2 Night Minimum, Rates change seasonally. June 29 - Columbus Day & Jan 2 - March 31: $250 nightly, $1575 weekly Apr 1 - Jun 28 & after Columbus Day - Dec 20: $200 nightly, $1260 weekly Holiday Rate (12/ 21 - 1/1 & Feb Vacation Week): $270 nightly, $1695 weekly (3 night minimum) 9% Room Tax. NH rooms tax license number: 054096 No Resort Fees! No pets! 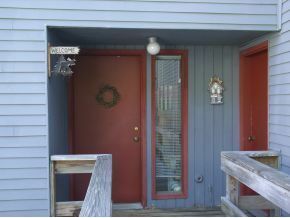 Walk to the Recreation Center from this spacious three bedroom, two bath split-level townhouse. The entry level has a foyer, open dining area, kitchen, and bedroom with a set of bunk beds. On the lower level you'll find a comfortable living room with a woodstove, and a bar table and stools. The upper level has a bedroom with a queen bed, another bedroom with a set of bunk beds, two bathrooms and a laundry room. Rental comes with linens, bath towels, cookware, use of dumpster for trash, toilet paper, paper towels, bath soaps, trash bags, (3) passes to the Community Center and cleaning & laundry upon departure. We are an onsite Management Company should problems arise. Your rental includes three passes to the onsite Community Recreation Center complete with two heated indoor pools, an outdoor pool, hot-tubs, saunas, fitness room, tennis and basketball courts, picnic and play areas, and a pond with sandy beach. Two pub/lounges are also on site. 2 Night Minimum, Rates change seasonally. June 29 - Columbus Day & Jan 1 - March 31: $230 nightly, $1450 weekly Apr 1 - Jun 28 & after Columbus Day - Dec 20: $180 nightly, $1135 weekly Holiday Rate (12/21 - 1/1 & Feb Vacation Week): $250 nightly, $1575 weekly (3 night minimum) 9% Room Tax. NH rooms tax license number: 054096 No Resort Fees! No Pets!